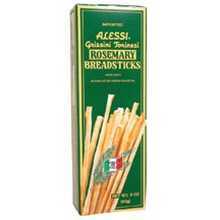 Save on Alessi Rosemary Breadsticks (12x3 OZ). Ingredients include Wheat flour, extravirgin olive oil, rosemary, yeast, malt,salt. Contains: wheat flower This product is manufactured on equipment that also processes products containing egg, milk, peanuit oil and sesame seeds. This decriptions is informational only. Please review the actual product for ingredients and suggested serving prior to use.